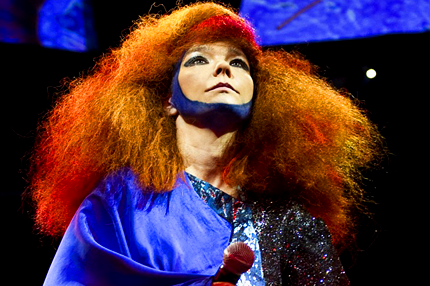 Björk recently joined the ever-growing list of artists recently sidelined with throat problems. An inflamed nodule on her vocal cord has been aggravated by her recent residencies and festival appearances in support of last year’s iPad album, Biophilia. This morning, however, she must have decided the announcement, which came from the organizers of Barcelona and Porto’s Primavera festivals, was too impersonal for her taste, and pulled a Sinead O’Connor to explain her cancellations via an open fan letter, posted to her Facebook with, in classic Björk fashion, a general disregard for your stuffy notions of punctuation and/or capitalization. We’ll let you find the very special rhyme she managed to wedge into this heartfelt cancellation apology. Read the letter below (via Antiquiet). i am sorry to announce I will not be able to play primavera sound (spain) , optimus primavera sound (portugal) , balaton sound (hungary) and afisha picnic (russia) 2012 .
after 2 weeks of voice rest i went to my vocal doctor and she came to this conclusion : i need to rest for 6 more weeks . the good news is that we both feel pretty confident i can start singing fully healed in the middle of june . i am very sorry and embarrassed about having to cancel things and having promised things and then not being able to keep my word , truly breaks my heart . especially to people who have already bought tickets . meanwhile biophilia has become its own feisty plant growing all different directions . and it isnt all bad . it has a lot of fun sides like for example the educational angle : reykjavík’s and buenos aires city school curriculums have now embraced biophilia educational program into their schools and we are partnering with the new york public library and the children’s museum of manhattan to launch biophilia as learning resource for new york’s children in july 2012 .